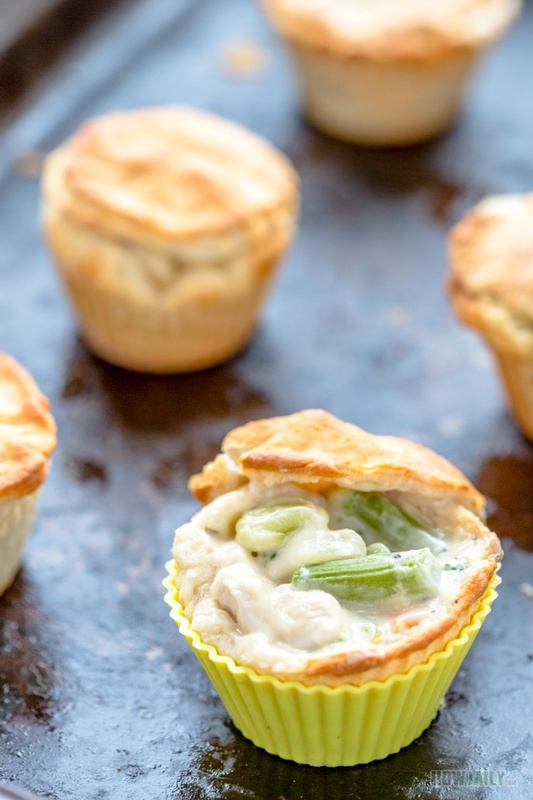 We all love and appreciate the healing power savory chicken soup, but turning it into a deliciously crispy fun chicken pot pie sound even more interesting. 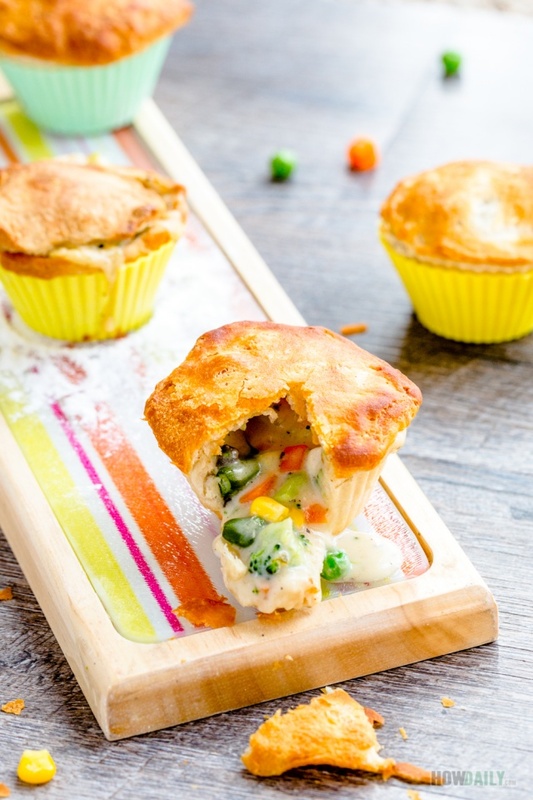 Thus, this mini chicken pot pie is the smaller, hand on version of that so popular condensed chicken soup with broccoli, corn, carrot and all the tantalizing herb. It doesn’t matter what size of tin pan you’re using, just make sure to grease them unless you’re having some liner. I have lots of those silicone cupcake, thus I just use those to line the cavity. 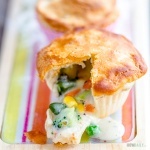 Result turned out much better looking, I now have bunch of muffin shape chicken pot pie. See, it’s just more fun to eat soup with your finger, don’t you think? Oh, any vegetable would work, though I just like the natural sweetness of corn kernels and carrot. Pea, cauliflower, celery… are all work, just make sure to chop down any large chunk. 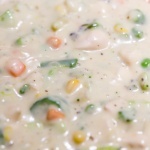 Add in any of your favorite herbs, or simply just dash of ground pepper and voila, the best chicken soup ever. 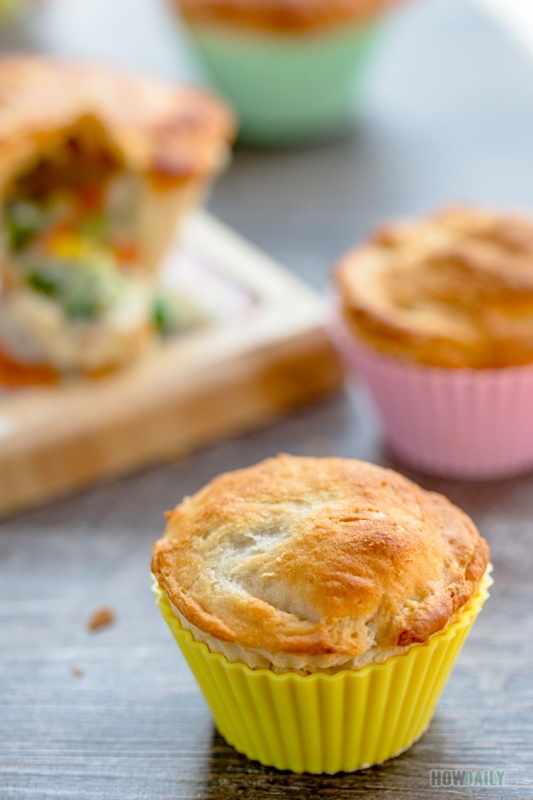 Baked golden crispy biscuit on the outside, creamy and thick chicken soup inside, what is not to crave for with these muffin size chicken pot pie? Make these in batch for your dinner party, everyone would be so wise. Measure and sift flour, baking powder ad a pinch of salt into mixing bowl. Beat in butter until mixture turns crumby. Add milk and mix until dough is soft and moist enough. 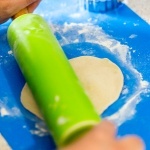 Roll dough into ball shape, wrap and let rest in fridge. Dice or cut chicken breast into small cubes. Chop veggies too if they are too large. In a sauce pan, melt the butter, when hot, add minced shallot and saute till soft. Add dice chicken and veggies, stir a bit to brown. Add 1 tsp salt and stir to mix. Pour in 3 cups chicken broth and bring to boil, then reduce heat to simmering. In a separate bowl, whisk 1 cup milk with 1/3 cup flour till fully mix, break any lump if exist. Stir in this mixture into sauce pan, make sure heat is at medium low, keep checking and stirring every minute or 2 until thick. When thick, Add ground pepper and adjust to taste then remove from heat. 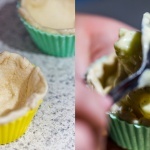 Lightly grease muffin tin pan. Flour the working surface, unwrap dough and knead until no longer sticky. Toss some more flour if need. Divide into 3 equal parts, use 2 portion for the bottom and 1 for the top. Roll the dough to about 1/8" thick, use a round cutter (2.5" for top, 3.5" for bottom) to cut out dough circles. Note that on the smaller circles surface, take a skewer or something to make some small hole/slits to allow air flow. Carefully knead the larger one to full cover the bottom cavity, spoon in creamy chicken then cover with top circle. Pinch a few time to seal all the edges. Bake in 400F preheated bottom rack oven for 30-35 minutes or until golden brown. Serve after cooling down for 10 minutes. Freeze leftover and just reheat in oven when need.